One of the most heated battles being waged today in the accounting industry is over online accounting software – both for those already using it, and those users getting ready to make the switch. New players are popping up, literally every month, claiming new features, more flexibility, and sporting fancy logos – and there’s about as much mudslinging and smear campaigning as an election November. Over the past several years, working for companies that allowed me to “play well in the sandbox with everyone”, I’ve been able to make friends, form strategic alliances, and have come to respect so many of the individuals and companies in this arena. I’ve had a front row seat on the sidelines and have watched it all play out as this duel has heated up…until the other day when I got a call. I’m proud to announce that I’ve been drafted! 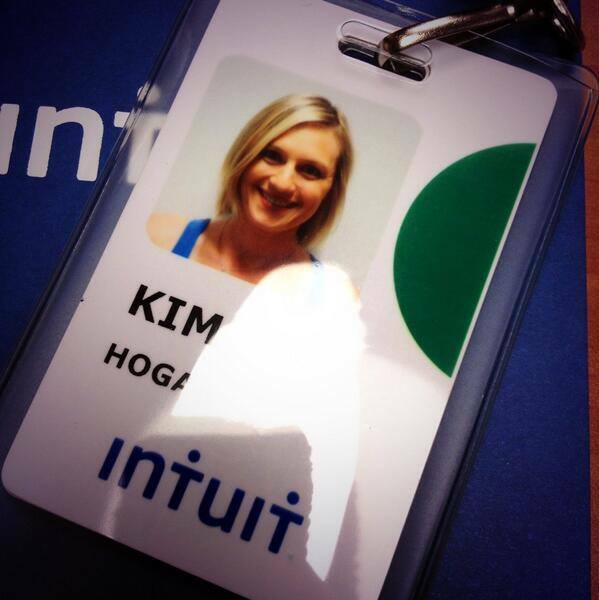 Effective this week, I’m suiting up to play for one of the largest accounting software companies in the world, Intuit. As a brand new QuickBooks Online is unveiled, so too is our brand new Dream Team, including my new colleagues, Ray Barlow and David Bergstein. Together, we’ll take on the challenge of helping CPAs bring their clients into the Cloud, and deliver the promise that you can never outgrow the new QBO. As if putting on an Intuit jersey isn’t satisfying enough by itself, the promise of teaming with industry legends like Darren Root, Doug Sleeter, reconnecting with some of my favorite partners like Bill.com, Avalara, and SmartVault, and working with newly formed connections like Richard Roppa and Stacy Kildal might just be the icing on the cake. The cherry on top is the opportunity to work even closer with one of the most influential people on my career, Scott Cytron. This will definitely be a marathon and not a sprint, so I’m packing my stilettos, but lacing up my Nikes for the long haul. We’re not afraid to roll up our sleeves, and know that this will be an exciting journey. The key is that we’ll be here to help firms, accountants, and our customers through it each step of the way. Sounds like a dream come true? Think again! Anyone who longs for a business trip to Hawaii (or any exotic destination for that matter) obviously hasn’t ever been on one of my island work adventures. Colleagues, family, and friends often tell me they’re envious of my travels. Unfortunately, at least in my experience, traveling off the mainland for work is no more enjoyable – but often a lot more frustrating – than any other business trip. Now before you call BS on me, let me just give you a glimpse into my little world a few weeks back as I traded in my stilettos for flip flops on my desperate search for power. After a great-but-exhausting 5-days in Las Vegas for the first part of the week (if you missed my recap, see Hey, Baby – Let’s Go to Vegas! ), my commute to Waikiki was extraordinarily crazy. Between the 4 ½-hour drive from Vegas, the 15-minute “layover” at home in OC, and my 1 ½-hour rush-hour drive to LAX, I arrived at the airport a cozy 30 minutes before my 6-hour flight to the beautiful island of Oahu. So, when I finally arrived at my hotel around 11pm local time (3 hours behind PDT), I was beyond wiped. I managed to be pretty productive on the flight and cranked out proposals, contracts, and even a blog post. But as we approached the island, my battery read my mind and decided it was bedtime. When I got to my room, I quickly plugged in to release the emails I had drafted, but after the day I had just been through, I threw in the towel and decided to tackle the rest in the morning. To my horror, I awoke not to the sound of waves outside my window, but to the sight of a low battery warning on my iPhone (which was charging from my laptop). I immediately realized that something was wrong, and my laptop wasn’t on. With my poor Ultra Book clocking as many frequent flyer miles as me, I’d been dealing with a temperamental power cord for weeks. Up until that point I had just managed to use the old “wiggle & twist” & “stick a wad of paper in there” tricks to keep things functioning. Not that day though. I was officially dead in the water. I got creative, managing to use my iPad & iPhone for my morning calls & web meetings…of course, not thinking through the drain on their batteries while doing so. When I finally got a free window, I decided to trek out to the mall to see if I could hunt down a replacement charger. Several hours later, with a dead iPhone, dead iPad, and visit to three different stores, I returned to my hotel room victorious (Mahalo to Jared at Best Buy in Honolulu, my geek in a faded blue shirt, who saved my day & helped me ensure that the cord was the problem). As I told this story to various people the past few weeks, the common reaction was an overly-sarcastic toned “Oh you poor thing, stuck in Hawaii with no laptop”. To which I can only reply that until you’ve been in my shoes, you’ll never know how bad it feels to be powerless trying to work on an Island. Hey, Baby – Let’s Go to Vegas! 2013 marked my 4th annual AICPA Tech+/ Practitioners Symposium in Las Vegas. Over the past 4 years this event has stood out as a highlight for some great (and not so great) reasons. 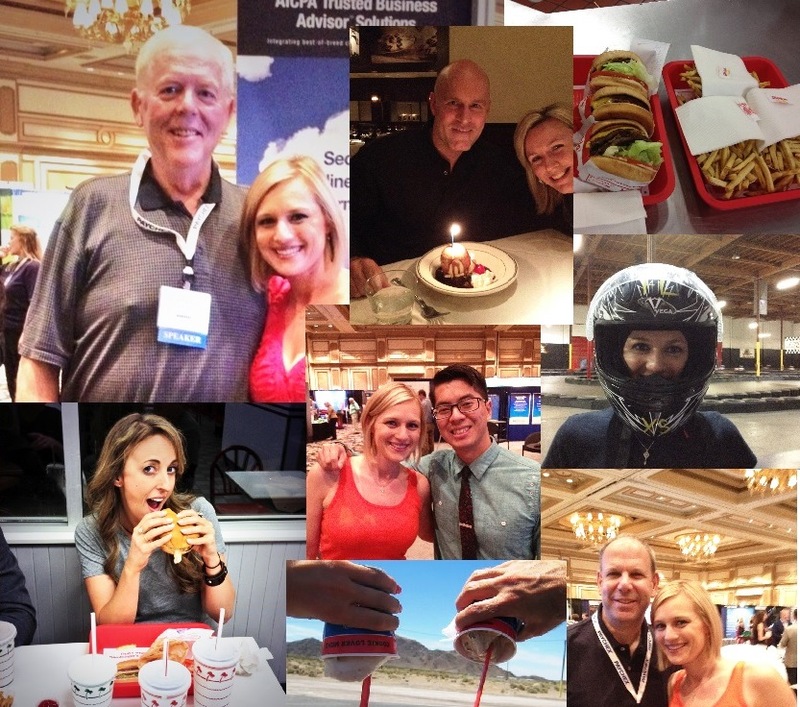 This year was no exception: I caught up with some of my favorite people in the industry, spent the night driving go-karts with a bunch of CPAs, and kept up the accounting trade show in Vegas tradition of invading In-N-Out with “In-N-Out rookies”. While this might sound appealing, I assure you that there are also some very serious side-effects involved with any Las Vegas trade show. To prove my point, I figured I’d spell out some of the reasons I love – and love to hate – the annual event that takes place in nobody’s favorite city. The Drive: Anyone else sick of packing in 3oz bottles, TSA pat downs, and cramming 5-days of business clothes into carry-on luggage? Well hop into our roomy Ultimate Edition (or similar) Avis provided rent-a-car for a smooth ride through the desert complete with stop in the now-famous Baker, California for a hard-earned, made-to-order Blizzard frozen dairy treat (held upside down for your viewing pleasure) from Dairy Queen. Bonus Feature: The sky is the limit for shoes in Vegas (both in height and quantity). The real question is whether the hotel closet is big enough for my entire footwear collection. Let me start by saying that there is no such thing as a short walk in Vegas. A not-short walk in 5” heels makes for quite the commute from room to exhibit hall to dinner to room to…well, you get the picture. Heaven help me if I forget my laptop charger (or any other necessary item) behind. I’ve just lost an hour of my day – and my feet will be cursing me every step of the walk of shame back to my room (purely hypothetical example). To add insult to injury, I’m fairly certain they have some type of Wurtzite Boron Nitrade for floors throughout Las Vegas, specifically designed to inflict extra pain on trade show attendees forced not only to walk – but stand in 10’X10’ exhibit hall booths. True story: there could possibly be a YouTube video of me walking barefoot through Aria carrying a pair of Christian Louboutins after I was officially defeated by the Vegas floors of death back in 2011. Rise & Shine Accounting World (if you’re not still out from last night that is)! It’s 6:30am and breakfast is served! Now, let me clarify that “Breakfast” might include grey-centered hard boiled eggs and other “trade show food stuff”, but thankfully, because it’s 6:30am, you haven’t had any coffee yet, so you won’t care! Speaking of coffee…don’t even get me started. Only in Vegas can you pay over $5 for a cup of terrible coffee that not only won’t give you even the slightest pick-me-up, but also won’t be remotely drinkable. My good friend @OrangeGirlNZ sums up the Las Vegas caffeine woes masterfully in this “Coffee Bible” of a blog (complete with photos). My advice: Live by it, she’s not kidding. Getting through PSTech week in Vegas is sort of like running a 5-day marathon in high heels on about 5 hours of sleep. While some might prefer to think that what happens in Vegas stays in Vegas, I think we all know better…what happens in Vegas lives forever on social media. See you next year! 1. Never let an editor catch you in Chuck Taylors. 2. If you eat healthy 99% of the time – you are entitled to one (1) Mocha Chip Blizzard on every trip through Baker, CA. 3. When it comes to accounting trade shows…nothing good happens after midnight. 4. There’s no such thing as too much (good) coffee. 5. Good things happen to those who follow through and take advantage of every opportunity – even if it takes longer than you think it should. 6. With the right business purpose – you can justify paying just about anything for a great pair of shoes. 7. Always look toward the future – and think about what you want your shoe closet to look like. 8. Your network and your reputation are both fragile: handle with care. 9. You can never be too prepared for a natural disaster. 10. A ride to (or pick up from) the airport can sometimes be the most treasured gift. 11. Let him carry your bags – you’ll be glad you did when you’re pushing his wheelchair in 40 years. 12. The Bellagio tram door won’t even wait for someone as important as him. 13. The best kind of bar is a raw bar. 14. It is perfectly acceptable to drive straight from the gym to In-N-Out Burger as long as it’s not more than once a month. 15. Never underestimate a 4 hour car ride through the Mojave Desert…it just might change your life forever. I suppose it’s fitting that I spent the final day of the busiest Xpitax/ XCM quarter of the year the same place that I started it – and the same place I spent all but two of the past 17 weeks – on airplanes. What I wasn’t counting on was a first (even for me) ever barefoot 100 meter dash through John Wayne airport. I’m pretty sure I could have kept pace with Michael Johnson in his fancy golden shoes. It’s safe to say that I plan to avoid 6:45am flights this next quarter. It’s also safe to say that I have thoroughly cleaned and sanitized both my feet as well as the inside of my heels. When you’re as much of a plane warrior as I am, you have to adapt to the road and learn how to make constant chaos your new “normal”. One thing I’ve learned the past three months is that no amount of pre-planning can make up for the accident on the freeway en-route to the airport, or the fact that there are only three (3) taxis in Yakima, Washington (and they don’t like working after midnight), or the rental car worker who decided not to wait up for the delayed flight…sometimes you’ve just got to roll with it (I promise, that is much easier said than done). When I started at Fujitsu over three years ago, I got some great advice from a colleague who put his arm around me and told me “Kiddo, pace yourself – if you don’t, you’ll burn out”. Boy did I think of that conversation over & over the past three months! Little did I know back then just how much I would rely on those words of wisdom in my next career chapter. It’s amazing how true this is not only in business, but in life in general. For people pleasers like me, learning to pace ourselves, not take on too much, and most importantly, not spread ourselves too thin so that we can’t do anything well, is vital not only to our success, but to our survival. I’m so proud to be a part of the XCM & Xpitax team as we continue to set new records for both organizations. I’m even more proud to know I’m playing a part in hitting those marks, and pushing us to the next level. While I’d love to stand up and do the “XCM Quarter Three is Over” victory dance & celebrate the milestones that we’ve achieved – I don’t even know that I have the energy to do so…I’m feeling a bit more like Kerri Strug in Atlanta – raising my hands in victory, and limping off to recover. So as January comes to a close, and we turn the page into February, it’s with great pleasure that I now hand off the baton to my clients – get ready, folks, it’s your turn to run the tax season race now! I’ll be here cheering you on, dropping by hugs and coffee and other necessities. We know you can do it…just remember to pace yourself!